It was that line from the Bible that led to creation of the Cardiff Giant. Standing at ten feet tall and weighing around 3000 pounds, the impossible man of stone is the subject of April's Monster of the Month. Are you ready? Then we shall begin. 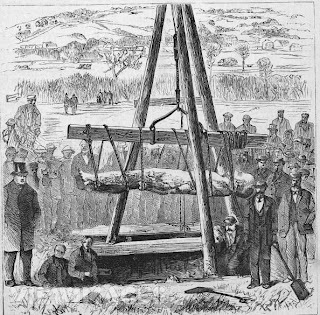 On October 16th, 1869, Gideon Emmons and Henry Nichols of Cardiff, New York, were hired to dig a well by farmer William Newell. When their shovels struck something hard beneath the soil, they unearthed an enormous human figure, seemingly fossilized. Newell was quick to put the thing up for display, claiming that it was a petrified corpse belonging to the last of a lost tribe of giants. He charged twenty-five cents for people to take a look. The following day, business was so good that he raised the price to fifty. Geologists and archaeologists cried foul, convinced that no such man could've once wandered the hills of Cardiff. Several evangelical ministers leaped to it's defense. The Giant drew such crowds that it was eventually moved to Syracuse under the new ownership of a group of New York investors. Famed circus proprietor P.T. Barnum leased the giant for three months. It cost him sixty-thousand dollars, but Barnum made sure he got more than his money's worth by secretly having a plaster duplicate made while it was in his possession. Upon returning the original, Barnum began displaying his copy, insisting that the copy was the genuine Cardiff Giant and that he one resting in Syracuse was a brazen sham. Outraged by the sheer chutzpah of Barnum's claims, the owners of the true Cardiff Giant sued.The courts, firmly convinced that both giants had been fabricated, were unsympathetic to owners of the original. Meanwhile the newspapers had a field day, and P.T. Barnum was famously misquoted as saying "There's a sucker born every minute." From out of the blue emerged George Hull, a tobacconist with a story to tell. Hull proceeded to bust the Cardiff Giant secret wide open, with the explosive revelation that he was the giant's creator. It turned out to all be a practical joke. Hull was a life-long atheist, and in 1868 he had an especially fiery argument with a fundamentalist preacher concerning the line from Genesis that spoke of giants. Hull bought a block of gypsum from Fort Dodge, Iowa, claiming that it would be used to create a commemorative statue of Abraham Lincoln. The block was shipped to a German stonecutter in Chicago. Sworn to secrecy, the stonecutter carved the block into the giant. The illusion of ancient age was accomplished by staining the stone and wearing it down with acids. Pore-like pock marks were chipped into the stone using knitting needles. The completed giant was sent to Hull's cousin, William Newell, who buried it in his farm. The entire process cost Hull two-thousand six-hundred dollars, but Hull was delighted when it was dug up a year later and caused such a commotion. 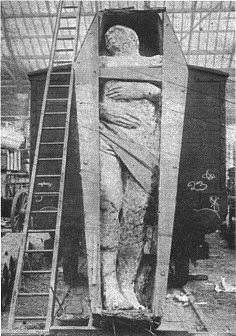 In 1870, the Cardiff Giant and it's plaster twin were legally declared hoaxes by New York courts, and the lawsuit was dismissed. That year, Mark Twain wrote "A Ghost Story" featuring the phantom of the Cardiff Giant haunting the plaster replica of his petrified body. L. Frank Baum wrote a poem about the giant the following year. These two Cardiff Giant themed works assured it's place in history. After an ignoble stint as a novelty coffee-table for an Iowa businessman, the Giant was sold to the The Farmers' Museum of Cooperstown, New York, where it resides today. Barnum's plaster copy is currently displayed by in an arcade/oddity collection called Marvin's Marvelous Mechanical Museum. Glad to see that our Giant has been selected as your "Monster of the Month." If you'd like to see more about the Giant's adventures since his move to The Farmers' Museum in 1948, be sure to check out our recent post about him at http://thefarmersmuseum.blogspot.com. Or better yet, come check him out during his 61st season at the museum now through October! Thank you for the comment! I'm sorry for the late response. 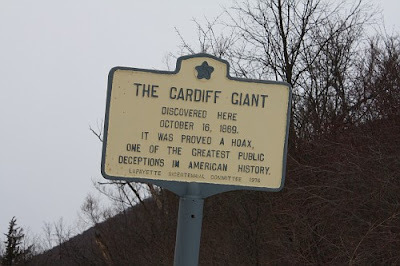 The Cardiff Giant has always been a favorite bit of folklore, and while I don't know whether I'll have the opportunity to visit Cooperstown, I would love to the meet the Giant in person. I've added the Farmer's Museum page to the Hyper Kitchen's link column. Thanks again!